Explanation: Newborn stars lie at at the heart of the the Orion Nebula, hidden from view by the dust and gas of the giant Orion Molecular Cloud number 1 (OMC-1). 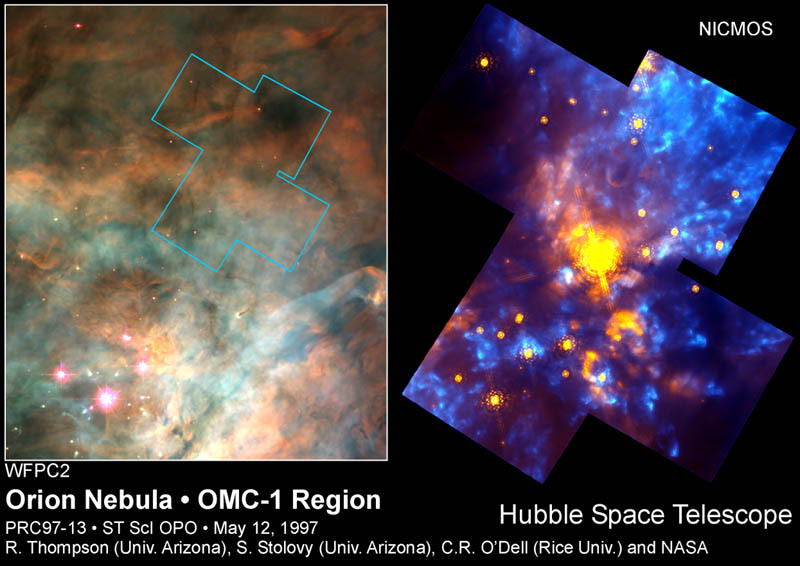 Sensitive to invisible infrared wavelengths, Hubble's NICMOS camera can explore the interior of OMC-1 detecting the infrared radiation from infant star clusters and the interstellar dust and atoms energized by their intense starlight. In this false color picture, stars and the glowing dust clouds which also scatter the starlight appear yellowish orange while emission from hydrogen gas is blue. The dramatic image reveals a wealth of details, including many filaments and arcs of gas and dust -- evidence of violent motions stirred-up by the emerging stars. The bright object near the center is the massive young star "BN" (named for its discoverers Becklin and Neugebauer). 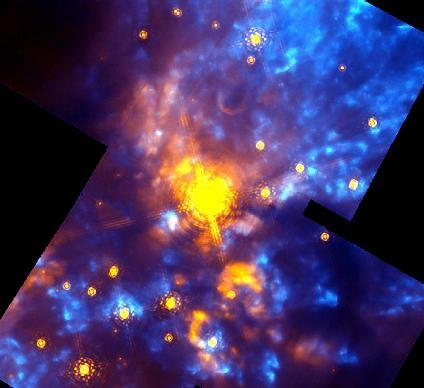 The pattern of speckles and ripples surrounding BN and other bright stars are image artifacts.